Who knew that TV could teach you how to change the world! But then again it’s not every day that a police comedy takes on police racism. Embedded in Brooklyn Nine Nine’s approach to sitcom writing are a few lessons about how we can successfully communicate important, difficult issues to a wider audience. First step in any communication strategy is – who is doing the talking! For Brooklyn Nine Nine, it was all about who was on the team. They broke all the rules of the old white sitcom. Brooklyn Nine Nine was intentionally diverse but not in an annoying stereotypical or tokenistic way. They brought in the best people from all the corners of the acting community. Their new look team gave them permission to say things differently. Their cast could talk about police racism because most of the police officers weren’t white. And their diversity has continued to embolden the kind of issues they talk about, recently creating more visibility around bisexuality and LGBTI rights. In any context, who is doing the talking matters. No ChangeMaking team should have an all white, all male cast. Diversity is not just an end in itself, but it is also an engine room for different ideas and approaches to change. 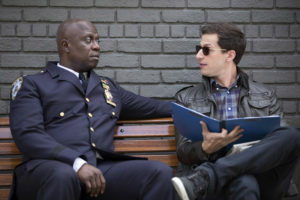 Brooklyn Nine Nine Co-creator Dan Goor and writer Phil Jackson were really clear that they could only carry a message about police racism if that message was consistent with who Brooklyn Nine Nine was. The story needed to be in the voice of the characters, and needed to be explored through conflict that emerged between the characters. It couldn’t be parachuted in over the top – it had to “fit.” They needed to be true to who they were. This goes for us all – political engagement with people who are different to us requires us to be authentic. Too often people think that engaging with someone different requires you to absorb a lowest common denominator identity – where you are so bland that you don’t offend anyone. The lesson from Brooklyn Nine Nine is that the opposite is true. You will only engage others, and persuade others if you carry your own voice. People need to be able to trust that it’s “you” before they will listen and hear what you have to say. We should break the rules of how we communicate. Brooklyn Nine Nine has produced a different kind of television by refusing to be like the sitcoms that came before it. They break the rules all the time – creative casting, mixing up plot leds – the podcast episode goes into this in more detail. ChangeMakers need to shake things up if we are going to tackle the hard issues of our time. This is especially the case with how we communicate. Too often we sit with people that we know and engage in comfortable conversations about issues on which we agree. We have our own rules – scripts – in how we communicate and we play it pretty safe. Brooklyn Nine Nine shows how powerful it can be to intentionally decide to rip up the script and do things differently. They had two co-creators determined to make a different kind of show. They then surrounded themselves with a diverse cast and writers room who could encourage them and hold them accountable to this vision. And then, slowly, that big team has got bolder over time. Powerful communication isn’t simply about the words that are used – it is much more about the approach to how stories are written, about the team of people crafting those stories and about knowing who we are as storytellers. Brooklyn Nine Nine helps ChangeMakers by making this deeper approach to persuasion so much clearer. 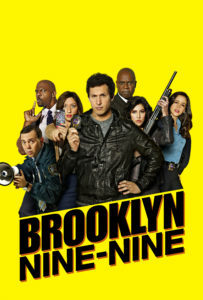 ChangeMakers Podcast Series Two, Episode One is about Brooklyn Nine Nine, featuring interviews with Dan Goor, Terry Crews and Phil Jackson. Listen to the episode on Podcast One, Stitcher or Apple iTunes. Or see more here.